Are you looking for ways to warm up during the icy weather? Look no further than what the folks at Lansbury Court are doing! During a recent afternoon at the home, singer Marcus arrived to perform a variety of different songs, ranging from classic and memorable tunes, to some unique twists on modern day hits. Everybody that was able to headed straight for the dancefloor, including the homes’ staff and even some of the resident’s family members. Those who couldn’t hit the dance floor were still waving their hands, clapping and singing along to the music. 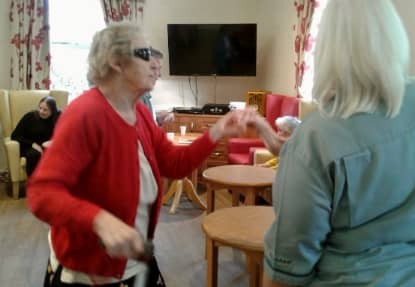 “All of this dancing is bound to keep me fit, it’s great exercise”, added Edith, another one of the homes residents.